$3,950 complete with suitcase style box! The BRAVADO A2 features a 3-hand Swiss-made mechanical movement with date, automatic winding, smooth sweeping seconds and 25 jewels. The dial is clean in design and stunningly unique. The bold case is of impact-forged, surgical grade 316L stainless steel and precision machine sculpted. The screw-down crown is placed in our signature 10 o’clock position for anatomical ease and distinction, while a wide, sculpted stainless steel bracelet combines elegance and comfort. 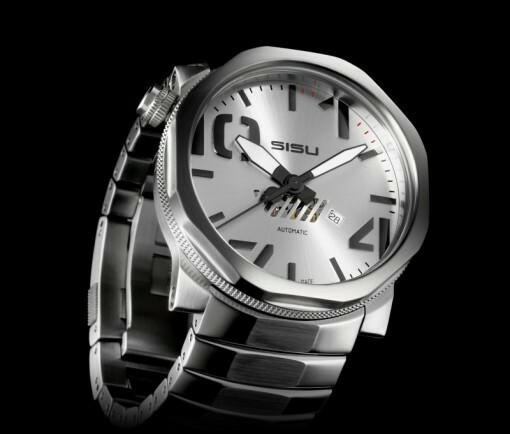 This SISU timepiece is shielded by an anti-reflective pure sapphire crystal, the hardest and most scratch-resistant lens material used in the world of fine watch making. The BRAVADO A2 is an individually serial numbered Limited Edition timepiece. The BRAVADO A3 is an individually serial numbered Limited Edition timepiece. N E W L O C A T I O N !! Next to See’s Candy, Game Stop and Big 5.